Now, I need to start by mentioning the first cut scene of the game in order to get it out of the way. This game opens with Skeletor playing this game on an ipad. And a brief exposition to explain that ‘Skeletor has created a sinister new app that will defeat his hated enemy once and for all’. It is a strange moment of post modernism which feels instantly out of place but that thankfully they are pretty quick to forget. He-man arrives to save the day, he falls into a trap, he escapes and starts to chase down Skeletor. And thus the plot is set and the game begins. 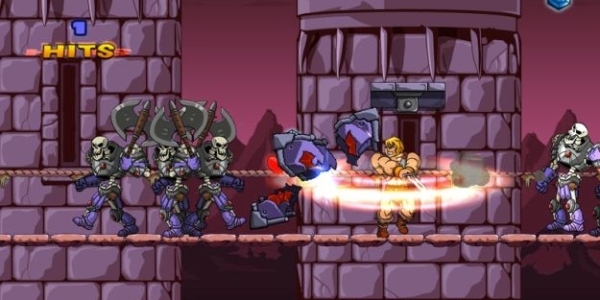 The game itself is side scrolling hack and slash affair in the vein of Streets Of Rage or Golden Axe. You plough through waves of enemy’s, collecting gems to purchase upgrades and at the end of each area tacking on one of Skeletor’s many henchmen as a level boss. The upgrades you can purchase are the usual fare of increased health, new moves, and special power moves in the way of help from Man-At-Arms and the ‘Power of Greyskull’. The Streets Of Rage comparison is particularly apt here as you can generally get through the level using your standard attacks and save your power moves to beat down the bosses. Unfortunately these moves are grossly over powered and will pretty much take down any enemy in one swipe taking away any sense of challenge. The level design is solid throughout, levels are short enough to suit the pick up and play mentality of mobile games yet still feel involved with a 3 star based rating system as intensive to go back and work some more on each level. As the game progresses the enemy’s get faster and bigger and better armed giving a nice difficulty curve throughout. 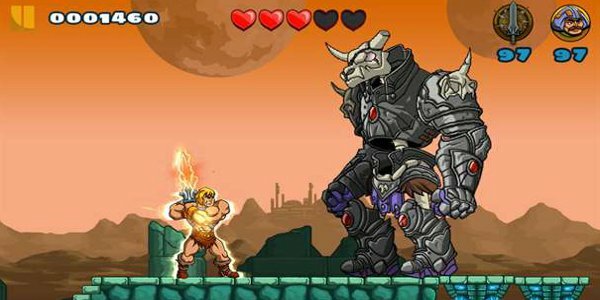 Graphically the game aims to modernise the look of He-Man whilst keeping the core elements, and for the most part does well except for the unfortunate hero himself who looks like a plush toy version of himself. Where they fall down however is in the controls. To be fair, controls for this kind of game on a touch screen device are always going to be tricky and they’ve given it a good shot. To run you move your left thumb to the right and to run back you slide it to the left. 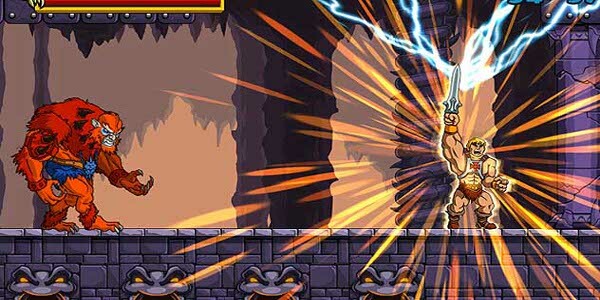 To jump you move your right thumb up and to attack you tap the screen with you right thumb. It all initially seems intuitive and smooth, however they simply often don’t work. When you have enemy’s coming at you from both sides the lag between input and He-Man actually turning around will often lead to cheap feeling deaths. This is a game bursting with potential. 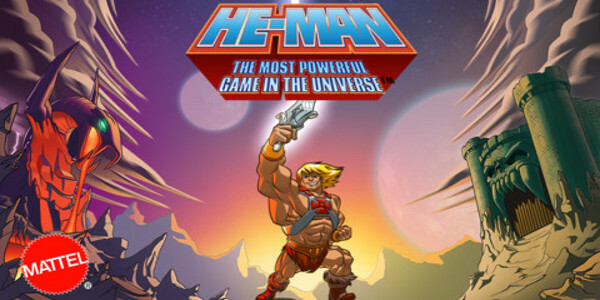 If you’re going to steal, steal from the best, and He-Man steals from some of the best games of a generation. It is both challenging and rewarding, the level design is perfectly suited to quick, mobile sessions and is undeniably full of unit shifting nostalgia even to someone like me who doesn’t really remember the show. Its just unfortunate that unresponsive controls all to often spoil all this with overwhelming frustration. Hopefully this is something that can be fixed at a later date. +Solid Level design keeps to working towards the end. -Grossly overpowered special moves make boss fights too easy. +Nice smooth art style looks impressive. -Occasionally get a bit too cartoony. +Epic battle music work well the set the mood. Next Post Is James Bond a Sociopath?